Measurements: 2.4 x 4.42 inches; or 61 x 111 millimeters. Booklet included: Yes, 24 pages, a sheet that unfolds. Individual pages measure 2.4 x 4.4 inches, or 61 x 110 millimeters. Comments: This is a beautiful & subtle deck, very Chinese in feeling. The way some of the minor arkana objects fly through the air remind me of great Chinese wizards. 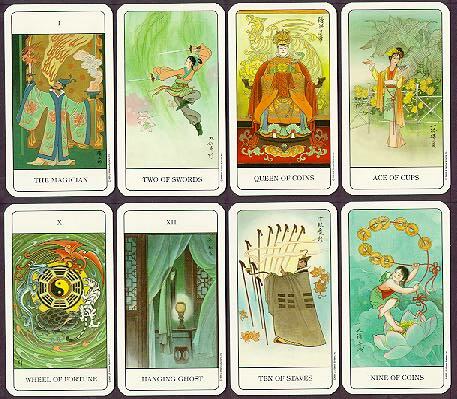 Since tarot often shows scenes & techniques used by western pagans, it is interesting to see how Chinese magic differs in style (and results) from its western counterpart. Chinese magic seems much less group-oriented & much more powerful in its outward manifestations. On the other hand, there is a feeling of bluff as well.